RIGrunner, - Introductory Price of $79.95 Until March 15, 2002, NOW SHIPPING. The new RIGrunner 4012 Intelligent DC Power Distribution Panel is a convenient way to power your entire ham station from your main 12 Volt DC Power Supply. RIGrunner provides a compact, rugged and convenient way to power your 12 VDC HF/VHF/UHF radios and all your 12 VDC station accessories. It is rated at 40a ICAS through 12 individual outlets each with an LED blown fuse indicator. These outlets are all Anderson Powerpole® color keyed, polarized, insulated, unisex connectors. Powerpole® connectors conform to the recommended standard of ARES, RACES & RSGB. Each outlet is RF bypassed, short circuit and overload protected, and polarity proof. A precision expanded scale power monitoring system with LEDs and audible alerts for high power supply voltage or low battery voltage conditions is a standard part of every RIGrunner. Our RIGblaster CD ROM Version 5.0 Sound card Software Collection is now available for $9.95. 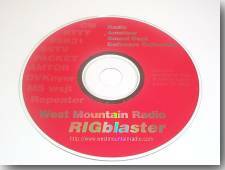 This is the CD-ROM that is included free with every RIGblaster we ship. Almost every program has been updated plus we have added several new programs such as WSJT and UI-VIEW. The CD-ROM also now includes; Operating Tips with audio recordings of the sounds of all the modes, The complete West Mountain Radio web page with all of our links and support so you can browse our website offline directly from the CD. See the RIGblaster CD-ROM page of our web site for more detailed information about the New Version 5.0 CD-ROM. Visit our web site frequently at www.westmountainradio.com, to see all our Amateur Radio Products. Copyright © 2002 by West Mountain Radio, An Optimaudio, Inc. Company.